The movie takes place over the final 12 hours of the planet. In the film, the Earth is being peeled, until it is a complete ball of fire. Possibly the best Australian movie since Mad Max, These Final Hours is 90 minutes of pure violence and confusion. The movie is a small indie flick, being released in select theatres in Calgary. The movie focuses on the character James (Nathan Phillips) who has both a lover, and a pregnant girlfriend. James is stuck in the life of a typical college student focusing on partying, drugs and debauchery. Through this adventure, he is faced with murder, suicide and insanity. We know nothing from the start. James’ path intersects with a small girl, Rose, and his adventure evolves into a hero’s twisted journey. The movie has a way of actually making you feel what the character is feeling so prepare for a journey that causes you to find yourself and to try to figure out who you are and what truly matters to you. James sees himself in a new light by saving the life of Rose while helping her find her missing father. It’s apocalyptic and fucked up one minute and warm and fuzzy the next when James and Rose are having a moment and bonding throughout. Then gore and chaos are thrown back into your face and your heart drops. Thank God this wasn’t in 3D. This movie takes you to a lot of places and it’s not perfect, but if you let yourself go for a minute it definitely has the potential to be enjoyable. 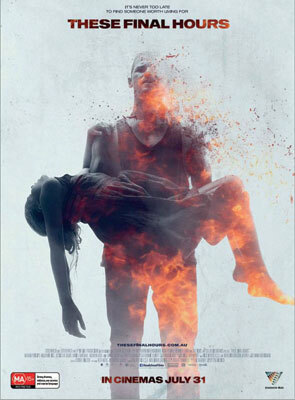 If you’re bored, stoned or you just like weird movies, definitely check out These Final Hours.